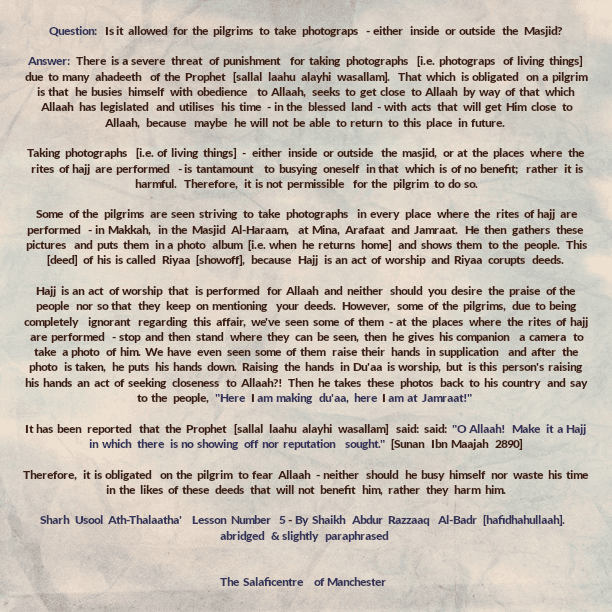 Question: Is it allowed for the pilgrims to take photograps – either inside or outside the Masjid? Answer: There is a severe threat of punishment for taking photographs [i.e. photograps of living things] due to many ahadeeth of the Prophet [sallal laahu alayhi wasallam]. That which is obligated on a pilgrim is that he busies himself with obedience to Allaah, seeks to get close to Allaah by way of that which Allaah has legislated and utilises his time – in the blessed land – with acts that will get Him close to Allaah, because maybe he will not be able to return to this place in future. Taking photographs [i.e. of living things] – either inside or outside the masjid, or at the places where the rites of hajj are performed – is tantamount to busying oneself in that which is of no benefit; rather it is harmful. Therefore, it is not permissible for the pilgrim to do so. Some of the pilgrims are seen striving to take photographs in every place where the rites of hajj are performed – in Makkah, in the Masjid Al-Haraam, at Mina, Arafaat and Jamraat. He then gathers these pictures and puts them in a photo album [i.e. when he returns home] and shows them to the people. This [deed] of his is called Riyaa [showoff], because Hajj is an act of worship and Riyaa corupts deeds. Hajj is an act of worship that is performed for Allaah and neither should you desire the praise of the people nor so that they keep on mentioning your deeds. However, some of the pilgrims, due to being completely ignorant regarding this affair, we’ve seen some of them – at the places where the rites of hajj are performed – stop and then stand where they can be seen, then he gives his companion a camera to take a photo of him. We have even seen some of them raise their hands in supplication and after the photo is taken, he puts his hands down. 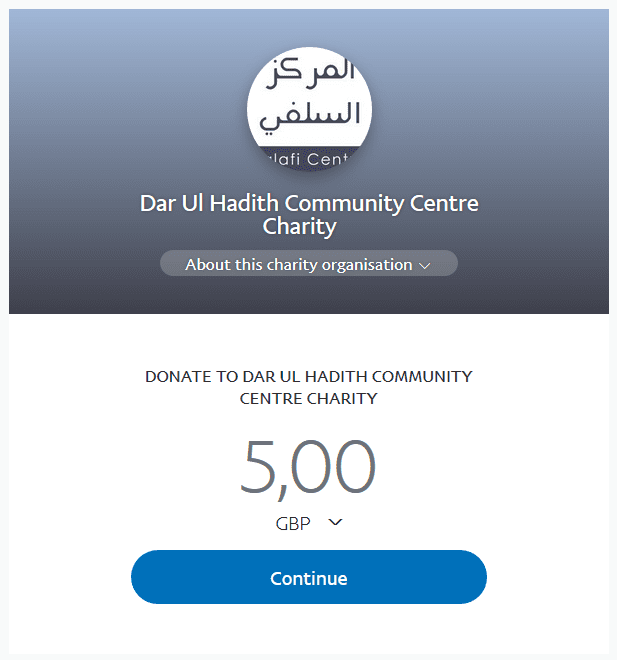 Therefore, it is obligated on the pilgrim to fear Allaah – neither should he busy himself nor waste his time in the likes of these deeds that will not benefit him, rather they harm him.